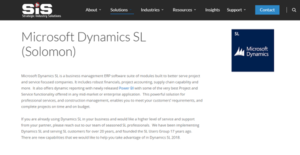 What is Microsoft Dynamics SL? Microsoft Dynamics SL is a modular business management ERP suite specifically designed and developed businesses in the project and service-based industry. Its modules include project accounting, financial management, and supply chain capability with robust and dynamic reporting features. The software comes equipped with the latest Power BI on top of its own robust project and service functionality, easily making it one of the best business management ERP for project-based and service-focused companies, including professional services providers, construction companies, heavy equipment rentals, and engineering firms among others. Powerful and feature-rich, Microsoft Dynamics SL has all the tools businesses needs to help them meet their customer requirements, even complex ones, and deliver projects on time and within budget. Microsoft Dynamics SL is a business ERP software that is continuously improved and extended over the years, with developers adding more features and capabilities and fixing issues on a constant basis. In today’s world, a software is considered outdated when you haven’t updated it within two to five years. On top of that, you need to keep up with the hardware requirements to remain abreast with fast-moving and progressing technologies. With Microsoft Dynamics SL, you never have to worry about lagging behind. You get an ERP system that is constantly improved with the best features and the latest technology to ensure that your operations remain productive, all your assets efficiently maximized, and a business that is not tied down by old legacy systems that can no longer run with today’s hardware. Microsoft Dynamics SL seamlessly integrates with many of the world’s popular and leading business software and applications, including Microsoft’s suite of tools, Salesforce, Windows, SkyDrive, Oracle, and Sybase among others. Such capability allows you to fully extend Microsoft Dynamics SL’s own set of functionalities, resulting in enhanced efficiencies and optimized performance. You can easily centralize your processes, integrating your ERP software with your existing accounting, CRM, and lead management systems without much difficulty. Microsoft Dynamics SL puts all your business processes under one roof, making it easy for you to view your business, transactions, leads, historical data, and more, which means you can access any information you need or want and respond intelligently and rapidly to ensure business success. Since each company has particular business requirements, it is prudent for them to desist from searching for a one-size-fits-all perfect software system. Needless to say, it would be pointless to try to find such a system even among market-leading software applications. The intelligent thing to do would be to catalog the various important factors that require consideration such as required features, finances, skill levels of workers, company size etc. Then, you should do your groundwork thoroughly. Read some Microsoft Dynamics SL reviews and check out each of the other apps in your shortlist in detail. Such comprehensive groundwork can make certain you reject ill-fitting applications and choose the app that offers all the elements you require for business success. How Much Does Microsoft Dynamics SL Cost? Contact Strategic Industry Solutions for basic and enterprise pricing information on their Microsoft Dynamics SL product and other details. You can also submit a request for a demo to see if the software is a perfect fit for your business. We realize that when you make a decision to buy ERP Software it’s important not only to see how experts evaluate it in their reviews, but also to find out if the real people and companies that buy it are actually satisfied with the product. That’s why we’ve created our behavior-based Customer Satisfaction Algorithm™ that gathers customer reviews, comments and Microsoft Dynamics SL reviews across a wide range of social media sites. The data is then presented in an easy to digest form showing how many people had positive and negative experience with Microsoft Dynamics SL. With that information at hand you should be equipped to make an informed buying decision that you won’t regret. What are Microsoft Dynamics SL pricing details? What integrations are available for Microsoft Dynamics SL? If you need more information about Microsoft Dynamics SL or you simply have a question let us know what you need and we’ll forward your request directly to the vendor.